Carol J. Alexander has put together a great little resource with her "Lessons from the Hen House" ebooklet lesson plan (like a mini unit study). It's perfect for homeschoolers and kids in traditional schools alike. It's great for any kid who likes farm animals, in fact. And what kid doesn't like farm animals? I can't wait to start this with my kids! At a sweet little price of $3.99, you'll want to own the whole series, called "Lessons from the Homestead." According to Carol, "Each one covers a different area of the farm. I launched Lessons from the Seed Catalog last spring. Lessons from the Tree House is almost complete and then I have Dairy Barn, Pig Sty, Bee Hive, Garden, and Kitchen yet to write. (And who knows what else I'll come up with!) Each booklet has over 50 lessons for teaching your children math, language, science, art, home economics, and more." You can get more information from her new website http://LessonsFromTheHomestead.com. She also has a free monthly newsletter by this title that offers additional lesson ideas, interviews, and encouragement for those who are trying to homeschool and homestead at the same time. 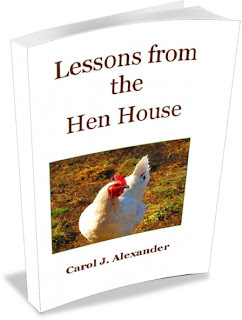 Carol is giving away a free copy of "Lessons from the Hen House" to one lucky reader of The (Mommy)Kerrie Show. Just leave me a comment here with your email address so I can contact you if you win! Good luck! I'll be drawing a name on Friday.